There several different green colored caddisfly hatches that occur on the northern Wisconsin freestone trout streams. These include the Rhyacophila (Green Rockworm) net spinner caddisflies, Cheumatopsyche (Green Sedge) and the popular Grannoms (Brachycentridae) caddisflies. 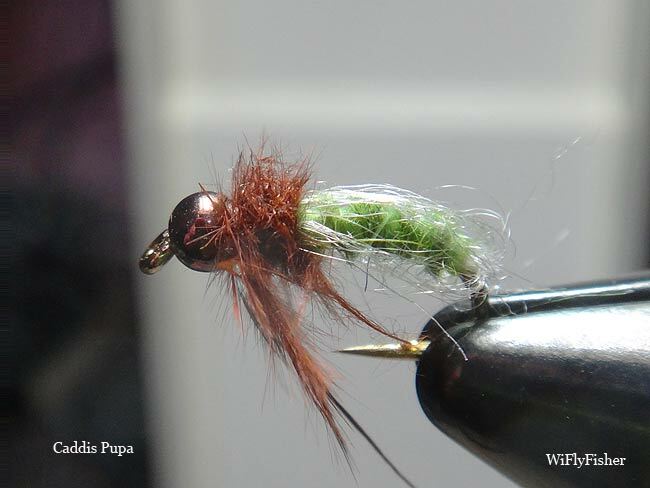 I prefer to use a more general caddis pupa pattern and just vary the hook size and tweak the colors slightly as needed. After putting the tungsten bead on the hook tie on the white thread. Tie on the clear antron at the bend, then tie on the stretch floss. Tie the green dubbing next followed by wrapping the stretch floss (or micro tubing) ribbing forward over the entire green dubbed body. 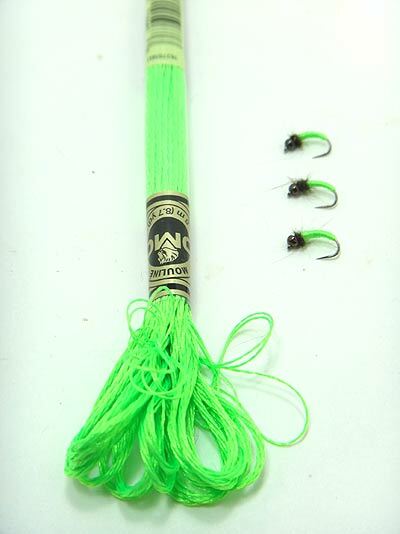 Pull the clear antron over the top of the ribbed green body and secure near the head. A couple of half hitches with the whtire thread then snip off. Wind on the brown thread next and twist the brown marabou fibers around the thread. While wrapping the marabou don't be neat, let it look sort of ragged to make it look more life like in the water. Whip finish and you are done. Below is a simple but effective green rock worm caddis larva imitation that works well in the Spring.